This is a new supertall skyscraper development – a trio of connected glass towers arranged in a row, with heights of 46, 70 and 95 storeys. The complex will contain residential units and a hotel. It will rise up to 1,140 feet (348 metres) at its highest point. The $950m project is backed by bouyant Chinese developer Wanda Group and Chicago-based Magellan Development Group. 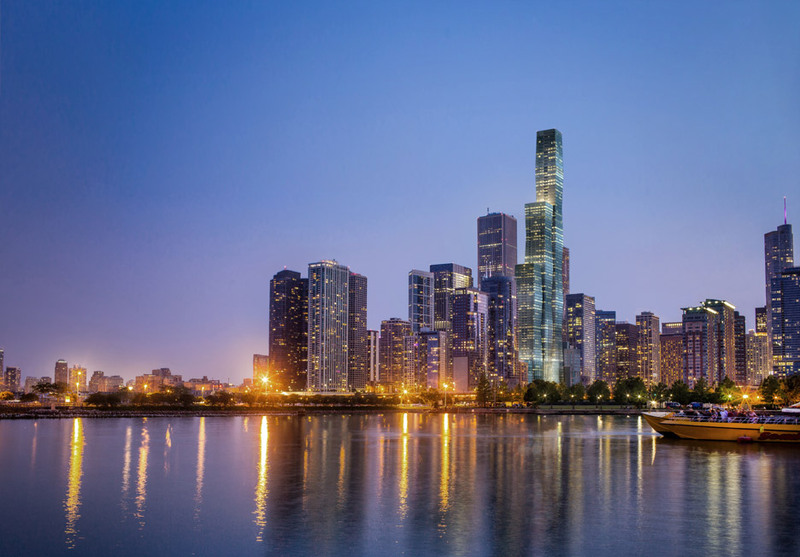 It is Wanda Group’s first project in the United States of America. 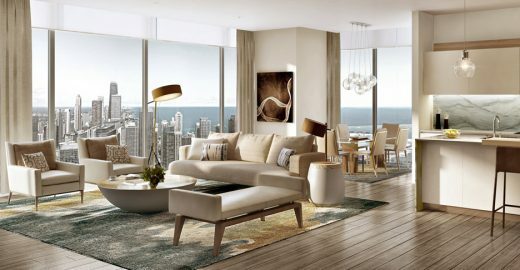 Prices start at $1m for a one-bedroom unit, with a two-storey penthouse costing a staggering $17.1m. Vista Tower, as the entire project is called, will be the third tallest building in Chicago behind the Willis Tower, and Trump International Hotel and Tower. 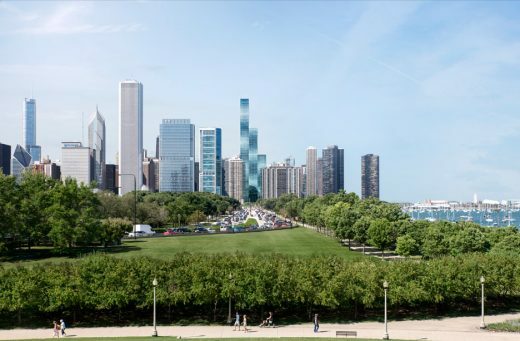 Renderings show wavy facades that overlook the Chicago River and Lake Michigan. The undulations and varying shades of blue-green glass take their cue from the water. Natural crystal formations inspired the shape of tower building. Architect Jean Gang said the massing was inspired by nature – specifically a type of crystal frustum” formation that resembles a pyramid without a pointy peak. The housing portion of the complex, called Vista Residences, will contain more than 400 luxury apartments. 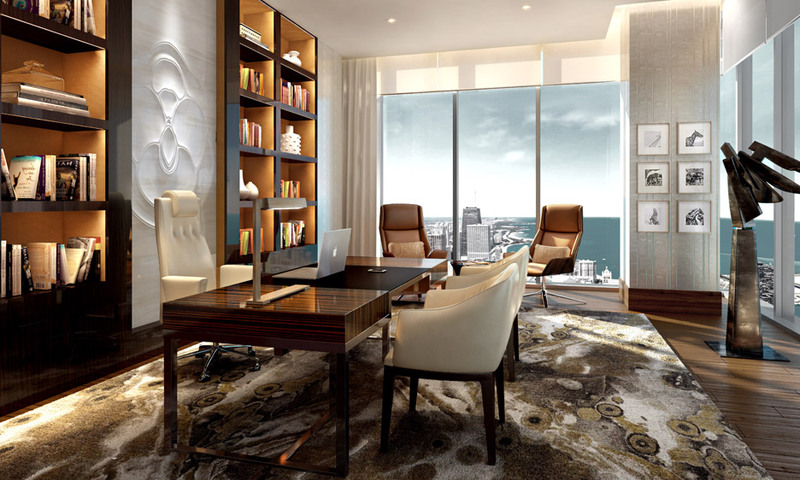 Hirsch Bedner Associates (HBA), California, is designing the interiors. They have used four different colour schemes for the apartments: topaz, amethyst, fluorite and sapphire. Floors 13 to 70 will feature apartments with up to four bedrooms, averaging more than 2,300 sqft (214 sqm). Floors 71 and 72 will offer 5,100-sqft duplexes (474 sqm). 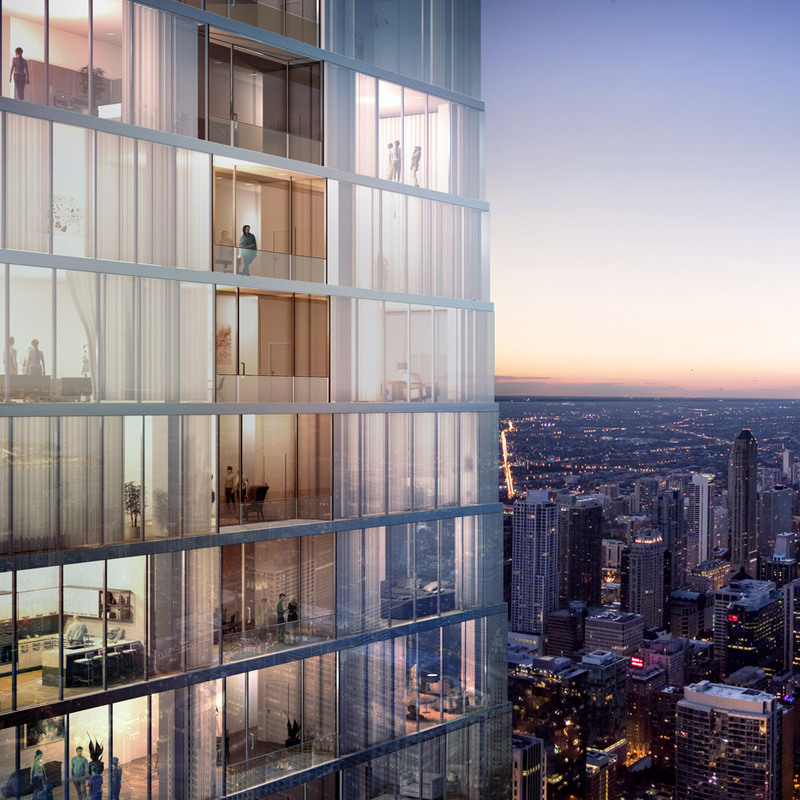 With more than 20 penthouses, including a $17.1 million two-floor penthouse, Vista Tower will feature the highest concentration of full-floor penthouses with unobstructed 360-degree views in the US. Tenant amenities include a wine cellar, game room, demonstration kitchen and an enclosed exercise area for dogs. The building will also offer an expansive outdoor terrace with a fire pit, hot tub and pool. 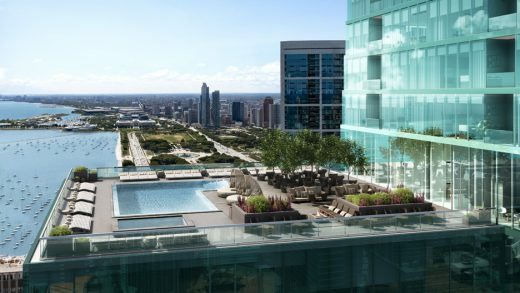 The Wanda Vista Hotel, designed to be a five-star property, will contain 191 guest rooms, an indoor pool, a spa and a ballroom. The hotel will also offer a fine-dining Chinese restaurant and a sky bar with an outdoor deck. Global firm Gensler is overseeing the hotel’s design. Completion is scheduled for 2020. 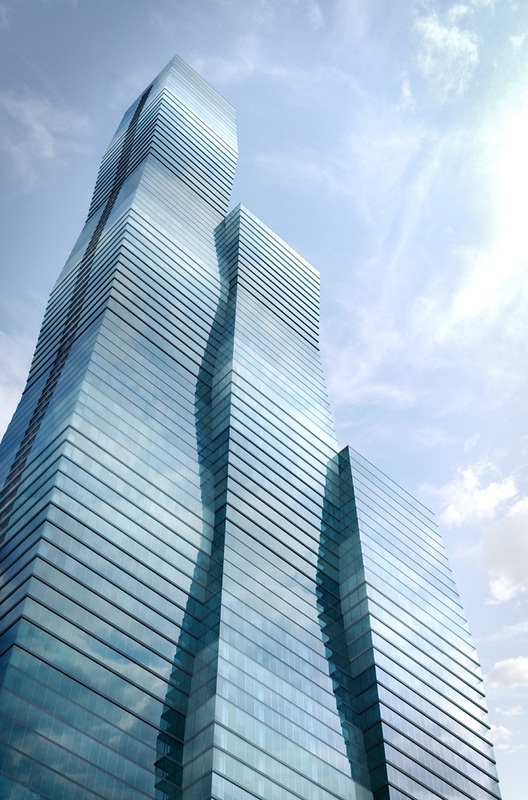 It will reportedly be the world’s tallest building designed by a woman. 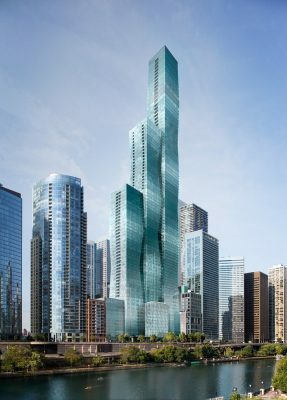 This skyscraper building is located on the northern edge of the 11-hectare Lakeshore East development. It will be located near the Gang-designed Aqua tower, an 87-storey residential tower than opened in 2009. 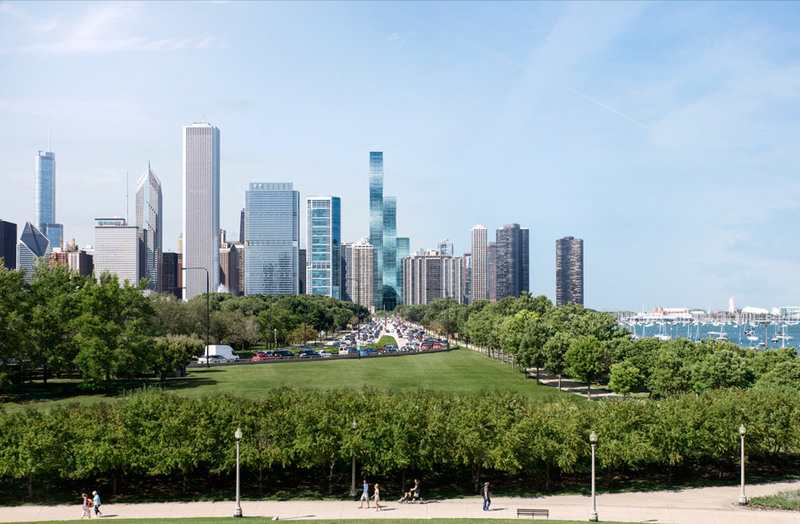 Studio Gang is Chicago architecture practice founded in 1997 by architect Jeanne Gang.